When circumstances batter us about and we are most prone to go off-course, a single, well-chosen Bible verse can guide us back toward the things that matter most. A “life verse” is a powerful, clarifying tool. A life verse is a short passage of Scripture that serves as a rallying cry to guide and focus your life. Carefully chosen after prayerful consideration, a life verse resonates with you in a personal way and serves as a lighthouse that continually guides you back to God’s mission and vision for your life. It should be a call to action. A good life verse should motivate you to run the right race for an eternal, imperishable prize. Find a verse that doesn’t leave you sitting comfortably on your backside, but rather drives you to act on the things that matter most. Make it personal. Find a life verse that speaks to an area in your life where you need extra reinforcement. Don’t pick a verse that simply augments an area where you’re already strong; look for a verse that supports you where you are weak. Find one that is succinct. A life verse should be concise enough to memorize and be recited in the heat of battle as you go about your day. It should give you hope. Choose a life verse that leaves you feeling better than you did before you read it. Find a verse that emphasizes God’s benevolence toward you rather than your shortcomings before him. Choose a life verse that is encouraging, uplifting, and positive; one that motivates you and infuses you with hope. Where do you find a possible life verse? Start by looking through your Bible. 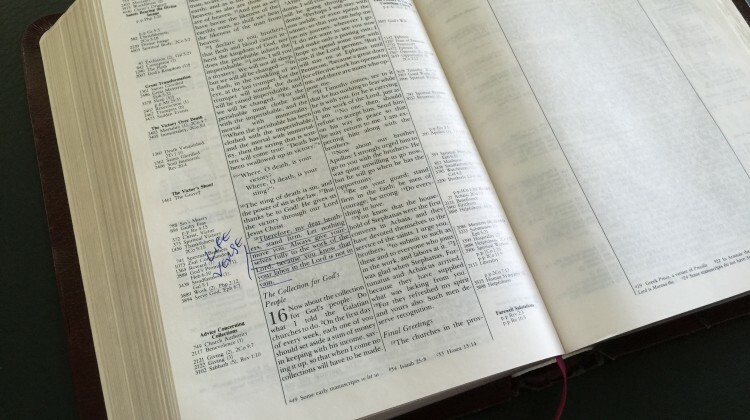 If you have underlined verses that are particularly meaningful to you, make a list of those that stand out. You can also go to a concordance and search for key words that resonate with you, such as peace, joy, faithfulness, hope, etc. There are also books that contain scriptures by topics and even apps that are available free or inexpensively so you can search on your mobile device. As you read through the verses, make a list of those that particularly resonate with you. Consider the criteria above and prayerfully ask God to show you one that is most meaningful to your life. When you choose a life verse, commit it to memory. Post it in the places you see regularly throughout the day: at your desk on the bathroom mirror, in the kitchen, in your car. Let it empower you to run the race that matters most.